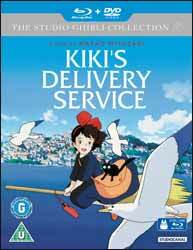 Kiki’s Delivery Service (1989 - 1 hr, 43 min) is another wonderfully warm-hearted tale from director, Hayao Miyazaki, who also wrote the screenplay. It was also the first film to be the subject of an agreement between Disney and Studio Ghibli to release Ghibli films in America with a professional voice dub. Like Porco Rosso (1992), Miyazaki sets the story in a fictionalised Europe; one removed from reality, making it both familiar and magical. For this film Miyazaki used the architecture of Stockholm and its surrounding towns, especially Visby, to provide the film with its distinctive look. This also has the added bonus of making the film more accessible to a non-Japanese audience. Thematically the movie brings to the forefront Miyazaki’s interest in portraying love, feminism and flight. Given that Kiki is only thirteen, Myazaki examines the power of adolescence and infatuation as a progenitor of change. When Kiki meets Tombo, he is very interested in her, partially because she can fly, an adjunct to his own obsession with the subject, but you also get the impression that he is romantically interested. The headstrong and independent Kiki initially spurns his interest, she does soften her view of him, by about half way through the film, by which time it is love through friendship. When she loses her powers it is only Tombo being placed in danger for her to rediscover the power of flight. Miyazaki also likes to show women, who are in control of their lives as is evidenced by the female characters in the film, all of whom are business owners, artists or designers. Kiki asserts her own independence by leaving home at thirteen to survive and thrive in a world, without her parents help. It’s always a delight to get another Ghibli film on Blu-ray as the format really shows the films at their best. Colours are solid and vibrant and the film is outstandingly beautiful, like many of the other Ghibli films. Unlike many western animations, where noise and movements appear to be created to hold the audience attention, Miyazaki is not afraid to linger on scenes or use silence to its full effect. The film is presented with an anamorphic aspect ratio of 16:9, with options for either LPCM English or Japanese 2.0 audio track. The English dub used actors, like Kirsten Dunst, Phil Hartman and Debbie Reynolds. The Japanese audio track has the original cast. Both tracks have their good points, although changes were made to some of the characters for the American dub, especially Jiji, who underwent a personality change. Extras on the disc are extensive, including the ability to watch the whole film with the storyboards. Ursula’s Paintings (2 min, 32 sec) is a self-running little piece showing the paintings which Ursula was working on in the film. Next we have a series of short films with the makers discuss various aspects of making the movie. These are presented in HD, with English subtitles. Creating Kiki’s Delivery Service (2 min, 26 sec) is a small piece with Miyazaki talking about the film. Kiki and Jiji (3 min, 26 sec) looks at the two characters construction. Flying with Kiki and Beyond (2 min, 49 sec) with Miyazaki discussing the difficulty in getting the flying scenes right. Producers Perspective: Collaborating with Miyazaki (1 min, 47 sec) and it does what is says on the tin, with Toshio Suzuki discussing how it was to work with Miyazaki. The Locations of Kiki (29 min, 13 sec), which itself was originally part of a larger documentary. It shows Yui Natsukawa’s trip to Sweden to travel around the architecture which inspired the film. It also is in HD with English subtitles. Behind the Microphone (4 min, 59 sec) lets the Disney vocal cast have their say on the film and the characters they portray, the piece mostly shows Kirsten Dunst. The disc is wrapped up with the Original Japanese Theatrical Trailers (7 min, 44 sec) and a bunch of trailers (7 min, 42 sec) for other Ghibli films, including the yet unreleased From Up On Poppy Hill. Kiki is one of Miyazaki’s sweetest films, which never becomes mawkish and is a stunning display of the animator’s art form. As a Blu-ray it’s a delight on the eyes and well worth picking up, even if you own the original DVD, this is the way the film was meant to be seen.